Second time making a post on this forum. I suddenly can't start my car and I'm having trouble diagnosing the issue. I have a 97 SL2 automatic, nearly 200,000 miles. I let it sit for almost two weeks with no activity. Today I tried starting the car and it won't work. All the lights come on, the gas gauge triggers, but when I turn the key all the way I get a loud repeating clicking noise. Some of the clicks are stronger than others, and when looking at the engine, every few seconds I see the belt move a little bit. But the engine doesn't turn over. Battery is good, installed a new one just a few months ago. For good measure I connected the battery to a friend's car with jumper cables with his car running, it made no difference. I replaced the starter just now, still no improvement. I looked at the wire connections on the starter and everything was clean. Does anyone know what could be causing this issue? All thoughts are appreciated. I've read the forums and seen a lot of posts about engines that won't start after a single click, but my clicking is repeating in an endless series with occasional bursts where the belt moves a little bit. Rate the quality of this post and help emcginnis reputation points. Click the reputation button near the bottom left corner of this message box. Thank you! That is a classic low battery symptom. The starter relay closes, the big starter load drops the voltage, and the start relay drops back out. This removes the starter load, and the battery recovers enough to pull the relay in again. Then the cycle repeats. The fact that this happened after two weeks could mean you either have a parasitic load or a bad battery. You aren't getting enough power to the starter. While it has the classic symptoms of a weak battery your cables could be to blame. You might have to inspect the cables a bit. If you have a voltmeter then do a voltage drop test for each of your battery cables. A lot of the time you can't see built up corrosion in the wires and it will eat up a lot of your battery voltage. Here is a link in case you have questions on how to perform the test. This is just basic but test each wire one at a time to make sure all are well. If you find a bad one, replace it. Rate the quality of this post and help Casper50 reputation points. Click the reputation button near the bottom left corner of this message box. Thank you! Had AAA come thru and double check the battery, it is at full power. The technician said he hadn't heard that kind of noise before - it's aggressive clicking followed by high-pitched screeching and jerking as the engine tries to crank but doesn't move. He thought it might be a seized engine, but the oil is full on the dipstick. I checked fuses in the box near the battery, visual inspection is clear. I did a cursory inspection of battery wires, I saw some fluid had collected where the black battery cable grounds to the engine block; I cleaned that up but still no improvement. Will see if I can do the test you mentioned and will follow-up. I'm just surprised that this happened all of a sudden, I've left my car sitting for 30+ days previously and it would start right up, not sure what could have caused this. Is it possible that one of your accessory pulleys is seizing up? While you crank on the engine it squeals the belt on the locked up pulley? Can you turn the engine by hand? Maybe try pulling the accessory belt and cranking it. 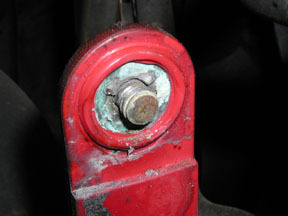 If it fires right up then check for a locked up or hard to turn pulley. Could be any of them, A/C compressor, power steering pump, alternator, water pump, idler pulley, or tensioner pulley. I may have missed one but you get the point. If your cables have any signs of corrosion on them you should pull the bolt out of the cable (not the easiest thing to do), then pull the cover off the connector and wire brush the whole contact area to get it all off. If you're just looking at the outside of the connector, you're not looking at the problem area. Disconnected battery cables and inspected the connections, absolutely no corrosion. Ran the meter on the battery while trying to start the ignition, levels were appropriate. I ran out of time so I took it to a mechanic. The issue had to do with wiring between the starter relay and the RKE. I'm picking up the car tomorrow morning, will get the full analysis tomorrow and post to the forum. This issue was the RKE was failing to ground properly. So they replaced the starter relay, and ran a wire from the relay directly to a new ground. That is the first i've heard of that problem. Madpogue has mentioned that Any issue with RKE can mess with starting. On my '97 the chronic (weak) starting issues largely resolved after renewal of the ignition switch. However, in very cold weather, the starter was yet uninspired.